The foremost name in 'art glass' is undoubtedly Rene Lalique. Like so many other decorative arts specialists, Lalique was actually apprenticed in an alternative field - that of jewellery, but being born near Vincennces, he could easily have been a porcelain man. At the end of his Paris apprenticeship, Lalique moved to England to study at art school before his return to France at the tender age of 20 to study sculpture. However, by 1881, he had set himself up freelance as a jewellery designer getting 'art nouveau' pieces accepted by the houses of Cartier and Boucheron. In the 1890s, Lalique had used glass in his jewellery and started to experiment in the lost wax or 'cire perdue' process to make moulded glass scent bottles, figures and mirror/picture frames and, by 1905, glass was produced in enough volume to allow Rene Lalique to open his first Parisian shop. 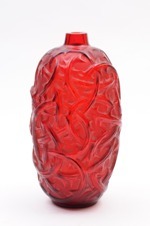 Red Lalique Vase 'Ronces', circa 1910-20. Lalique certainly struck a chord, bringing his artistic eye and technical and sculptural abilities, to a luxury market by using, let's face it, fairly industrial methods. It seems mealy-mouthed to suggest it and I cannot denigrate his ability to capture the age, but once the original was conceived, some other hand was on the lever. Having said that, most of us would be unbearably jealous to posses the rounded skills and ability that Rene Lalique had and history speaks for itself. His glass, during its heyday, was the epitome of the Art Nouveau age, and comfortably strode into the Art Deco camp. Let's be honest: if we bought a Picasso purely for its material value – how much would a sheet of paper and paint be worth? A pair of later Lalique cristal plaques. The golden years of glass production for Rene Lalique were between the First and Second World Wars. 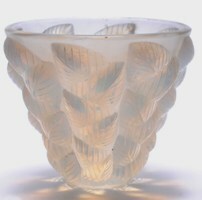 Nearly all pieces during this period were marked 'R Lalique'. After his death, this was shortened to just 'Lalique' and, from a collector's perspective, these pieces are less desirable. There are rarer patterns, but it seems nigh on impossible to list a league table of what's hot and what's not without filling pages. However, crisp casting and sharp detail with minimal seam lines are a must and if you are lucky enough to have good opalescent colour or indeed a colour other than clear or blue-tinged then you are probably on to a winner.